HSS sawblade 250 - 325mm Standard 300mm. 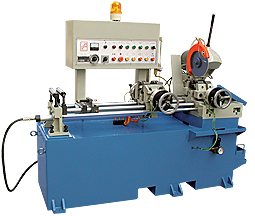 Automatic bar feeding, clamping and cutting off. HSS sawblade 250 - 350mm Standard 350mm. (inch) 83" x 42" x 73"
Motor, electrical control system, complete cooling system, pneumatic system or hydraulic system, service tools. * Infeed length: 1000 mm / 1200 mm / 1500 mm. * The manufacturer always performs product improvements to achieve the best possible performance. All specifications, dimensions and design characteristics shown in this catalogue are subject to change without notice. 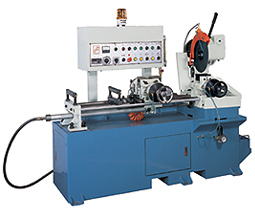 Product specifications are based on the actual machines. The manufacturer holds explanation rights.